Why A DJ costs What They Do. If you have hired a DJ, KJ or combination of the two, you might notice the discrepancy in pricing and wonder why one is so cheap and one can cost more. It is not just an arbitrary number on pricing that DJs come up with, but reasonable pricing based on a number of factors for your wedding or event. Two costs to a professional Vancouver DJ are staffing and labor. In order to have a number of DJs who are experienced, versatile with a nice personality that clients will like, a certain amount of compensation is required. My Vancouver DJs have the skill to be able to handle any type of event from a wedding, high school dance to a club gig and they can do it in a professional, amicable style. From answering the initial contact all the way through contracts, consultation, any prep work and performance of the event, there is a lot of labor that goes on to have the musical part of your event run smoothly. Most people see the DJ spinning the music, guests dancing and nice lighting leading them to believe that is all the DJ does. 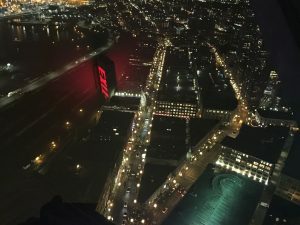 Rarely does anyone realize the costs of running internet, phone, lights, heat, paper, ink and all those large and small office costs that come into play. Clients also don’t realize the physical labor of loading equipment into the van, back out again into the venue, setup, take down at end of night, back into the van and then out again upon return to home base. That is a lot of work! Sometimes, that labor is intensified even more when a venue does not have an elevator and equipment must be hauled up stairs. There can be lots of physical issues in getting equipment into a venue including parking issues as well. Time is also another factor. For a wedding especially, a client will want to meet with the DJ at least one time before the event. So, the time it takes for the DJ to get to and from the meeting plus creating a checklist and play list for the dinner dancing and possibly the wedding ceremony can take several hours. You add on even more time for preparation if you are asking your DJ to do master of ceremony duties. On the wedding day, the DJ must travel to and from the venue plus, as previously mentioned, load in, setup and load out times can add to those hours. Technically, the client may be paying only for the hours of performance for their wedding or event but there are a lot of extra hours that go into making that happen smoothly. In addition, you DJ must purchase and maintain good equipment so that at every event, the equipment runs flawlessly. All the components that make up a decent DJ setup do not come cheaply and extras such as laser lighting, projectors and screens, portable battery powered equipment for our door wedding ceremonies, wireless microphones, etc., can really add up. Equipment must also be maintained or replaced. This can add hundreds or even thousands of dollars to operating costs a year to a music provider’s operating costs. Speaking of operating costs, as of this time of writing, gasoline was a $1.70 a liter! Add to that business car insurance, which just went up another 6% even for five star drivers, and these factors alone will definitely add to the costs of operating and maintaining a well conditioned, reliable vehicle to travel to meetings and events with. After all, you do want your DJ to be arriving at your nicely appointed venue in a presentable vehicle and not a taxi or a rundown car that might or might not make it to your wedding or event. Music costs are better than they used to be but having thousands of songs available and the costs of having a streaming service to add additional music choices for weddings and events are still significant. If you consider the costs of karaoke music at $1.99 a song, and a large library of 100,000 songs or more, than the costs are quite high to obtain and keep that level of service available to clients. These are just some of the costs that this DJ in Vancouver, a city notoriously expensive to live and do business in, runs into. So next time you are quick to dismiss the pricing of a well reputed and reliable music service company, please keep in mind the costs associated with them obtaining and maintaining their high level of service that you want to have at your next wedding or event. The Polish Community Center on Fraser Street has been existence for many years and has a well established center with all the amenities required, plus a few more including good rental rates, for an enjoyable wedding or event. The hall has a total of three different options for rental. In the basement part of the center is the disco hall. 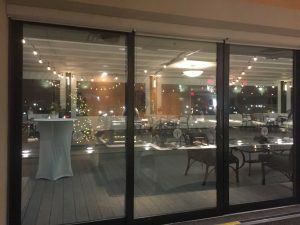 This rental space can hold up 150 guests and includes, as you can expect from the name, disco lighting complete with mirror ball. The area also has a raised stage and plenty of power plug ins for your band or Vancouver DJ. In addition, the room has an in ceiling projector and screen for your video or slideshow presentation. There is also an in house PA system capable of playing your dance music and speeches. A bar at the back of the room is nicely setup and can be staffed by your own bartender. In the back area but hidden from view, there is a fully functional kitchen for your caterer or meal preparation. This area would be a little difficult for mobility challenged guests as entrance for the front of the building involves negotiating stairs down to the basement. There are entrance doors from the back parking area into the basement and there are only two stairs down into the room. Unfortunately, to get to bathrooms in this area requires going up and down stairs. So this room might not be the best choice if any of your guests have mobility issues. The Main Hall is larger and holds up to 190 guests. This hall also has a raised stage and can include PA rental. You can also rent the in house projector and screen for your video presentation, the bar /bartender or the kitchen. All of these extras are add on and so there will be an extra charge for them. This part of the venue is a little easier for any mobility challenged guests. Entrance for the street goes right into the hall with no stairs and bathrooms are easily accessible. The Main Hall also has a balcony overlooking the floor and hall. Together, these two areas can seat up to 240 guests however, the balcony area only has stair access and no elevator to that area. You can rent the Main Hall and balcony area together, just the main hall without balcony or just the balcony. The balcony holds up to 50 guests. I am not sure, but I believe the balcony area does not have a PA, lighting or projector. All areas are air conditioned and there is free parking in the rear of the building. If there are two events going on at the same time though, there would not be enough parking for all. Street parking is limited. 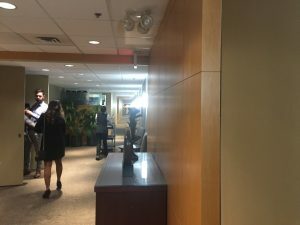 In addition, for mobility challenged guests, it would be a challenging walk or pushing a wheelchair from the back of the building parking lot, up a fairly steep hill to the front entrance to the Main Hall. Your wedding is both an exciting and sometimes a taxing new chapter in your life. The Interviewing and hiring process for choosing your vendors, booking your venue and preparing for your family and guest arrival, can be an exhausting time. Everything about your wedding is important to be sure, but working with your entertainment and/or DJ is one of the most important for a fun, danceable and memorable evening of celebration. One of the most difficult things for a Vancouver DJ, or any DJ for that matter, is to put together a correct playlist for a bride and groom that are not engaged in the musical portion of their special day. Sometimes, a couple will go through the process of meeting and hiring their DJ and then just disappear off the DJs radar until the day of their wedding. Sometimes It seems that a couple expect the DJ to read their mind and come up with the perfect music for them. While it is true, many DJs have a lot of experience with a variety of events including weddings, each wedding has its’ own unique characteristics that only the couple can communicate to their DJ. Some couples tend to hide behind their wedding planner as well and not be in touch with their DJ. Although a wedding planner is excellent at organizing and taking much of the pressure off of the wedding couple, music is not their specialty. It is important not to have a third party between the bride and groom and the DJ. I have heard of an example where the DJ had to ask all of his questions through the wedding planner and then wait while the wedding planner asked the bridal couple and then got back to the DJ. Not only did this take a long time but the DJ was getting vague answers…such as “play up tempo music” and “we will leave the music in your hands.” Well, come the wedding day, the DJ discovered the bride had wanted club mix versions of Top 40 music and only wanted the DJ to play a few minutes of each song before moving on to the next song. Had the DJ known, they could have had those club mixes in their library at the wedding. Like anything else, you need to have the right tools for the job and preparation is key to having the correct music for the event. So, be engaged directly with your DJ. A second tip on this topic is actually the next step in engaging your wishes to your DJ. Try not to be vague in what you want your DJ to do. Music is often a personal thing and can be subjective so getting a clear picture of what a couple want, in terms of music, is part of the DJs job. Periodically, guests at an event will say, “can you play something faster?” I will often ask for a specific example but they may say “I don’t know, you are the DJ“So, I will play what I think is a good fast dance song and they will still come back not happy with what I picked. I am sure you can see my point. Be concise with examples. Ask the DJ for ideas if you are not sure or brainstorm with your fiancé. A little bit of planning will go a long way to making the music at your wedding be successful and to the liking of yourself and the majority of your guests. The opposite side of the coin is not to get mired down in music choices. Remember, you can’t please everyone all the time. For the dance music, don’t be too concise on music playing times, switching up or order of the music. The best wedding events are where the music flows freely with the couple’s, and the guest’s requests mixed in the DJ’s choices. The third tip is to give time for changes. Try to avoid last minute changes in the music if you can and certainly don’t change the whole theme of your music at the reception. It is often possible for the DJ to do that because of their large library of music, but not always, and it is not advisable. Here again, I have heard of a couple who decided in the dinner section of their reception, that they didn’t like the dinner music they had chosen and wanted switch over to a blues themed music style in the middle of dinner. The DJ was able to do that but did struggle to find enough blues music in their library to fulfill the request. The music selection did not flow well with the classy location of the venue or with many of the guests for that matter. Some cultural weddings can be notorious for this and requests such as “Quick, play another song just like the last song!” are not uncommon at a crucial spot in the wedding reception. Although this DJ in Vancouver has had a lot of experience with this and prepares ahead whenever this is likely to happen, other DJs may not have as much familiarity with these types of weddings or at the last second requests. Just keep in mind too many last minute changes can throw things into disarray. To be sure there are lots of things to be aware of when working with your DJ to put on a musically entertaining wedding. 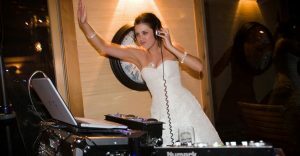 These three items are a few of the things to keep in mind when coordinating with your DJ on your wedding reception music. Karaoke can be a fun evening out and even though you may not be one to sing in public, sometimes after a few drinks, and at the urging of a few friends’, you might decide to give it a try…at least once. So where to start if you are at the local karaoke hot spot and find the urge to step onto the karaoke stage for the first time? First off, you will want to check karaoke host’s song list. 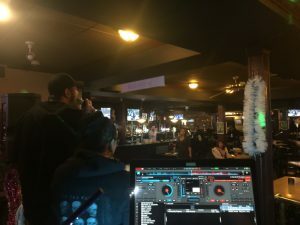 This Vancouver DJ / KJ has the karaoke song list online so it just matter of going to www.djboogieshoes.com/karaoke to check out the songs you might be interested in singing. I do suggest actually looking at the song list and not requesting something out of the air. There are millions of songs and no KJ (karaoke host has all of them). Look for a song that was a hit and not something obscure. There are lots to choose from…classics all the way up to new hits of today. Classic rock songs are still big but the powerful voices and ranges of that era can make them difficult to sing. Some 90s song such as U Can’t Touch This – MC hammer are easy to do range wise and Ice Ice Baby – Vanilla Ice is still really popular and fun to sing. The 70s also had some great music Mama Mia – ABBA is still fun, popular and easy to sing for the ladies, plus you can sing it with friends for support. It is always best to sing something easy the first time out. This way you have a better chance of having a good experience and to see if a second visit to a karaoke night is in the cards for you. Once you have narrowed in on the songs you want to sing, put in your request and await your turn. When it comes time to hit the stage, relax and enjoy it. Remember, this is karaoke and not an audition for American Idol. I am often amazed at how many karaoke singers take themselves so seriously. You would think that karaoke night is a major concert with millions of dollars at stake and a musical career by the way some people act…and I might add, by the way they treat the karaoke host. Don’t be one of those people. Karaoke is a social affair with your friends and other like minded individuals who happen to enjoy singing. So be gracious and have fun. A couple of karaoke etiquette rules to also mention are don’t scream into microphone. It is particularly hard on the speakers when people do that… not to mention everyone’s ears. Also, don’t slam the microphone down when you finish singing. Here again, this is hard on the equipment and if you break a microphone, it could set you back a couple hundred dollars. At the very least, you would be banned from signing at that venue again. No mic drops! You may think you are being cool, but really, you are just being rude and obnoxious with someone else’s hard earned money that it took to buy the equipment for you and others to sing and have an enjoyable evening. Karaoke is still a great way to be on stage and to do something with or for your friends and the audience in general. 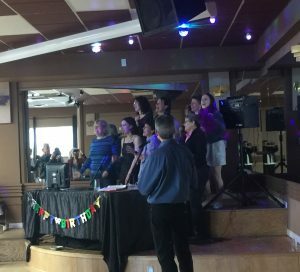 This DJ in Vancouver has seen and hosted a great many events and what keeps great people coming back again and again is the excitement, fun and comradery that people enjoy singing and listening to others sing a favorite song. Although The Arms Pub may not be a venue normally chosen for a wedding, it is very well set up to host many other types of events. Laid out well and quite spacious, the pub would be a nice consideration for parties and holiday celebrations. 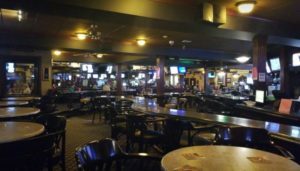 The pub is located in a strip mall configuration with a well stocked liquor store next door. You will never run out of your favorite spirit in this case. 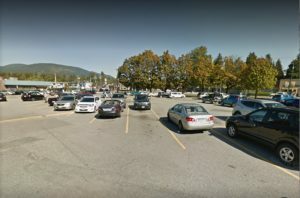 The location also offers plentiful, free parking. The entrance way from the parking lot into the venue is flat and perfect for any mobility challenged guests. You can easily roll a wheelchair or fit a walker through the double door entrance. This DJ in Vancouver had no difficulty loading equipment into the venue. 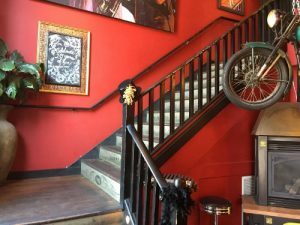 The inside of the venue is also fairly level with no stairs to access any areas of the pub except for an area to the left…and then it is only two small stairs. The washrooms are easily accessible as well. Inside the venue, there is nice spacing between tables and an interesting winding bar / table combination. The space is open with the traditional bar style area. One of the best things I like about The Arms is the stage. Most pubs don’t have a stage and this one is nicely sized one for the pub’s square footage. The stage is located at the back of the venue but is situated so that and music speakers will cover most of the room. The stage is perfect for small duos, DJs or Karaoke nights. There is plenty of room for your acts to dance around and entertain a bit and the large screen TV at the back of the stage works well to play your video presentations or run lyrics for karaoke. As a Vancouver DJ and KJ, this is a nice feature. There is no house microphone and only a standard house system for playing background music, but that can be corrected by your music vendor of you so choose to go with one. The staff are quite friendly and supportive. They work well with the clients and are very helpful to your vendors as well. Food is standard pub fare but there is quite an assortment of drink choices to choose from. All in all, The Arms Pub is a great old fashioned style pub that is not run down but well kept and looked after. I give it a 3.5 out of 5 stars. 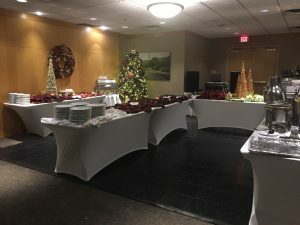 Most people’s first time experience with hiring and working with a DJ or KJ, karaoke DJ, is either for a wedding or some kind of celebration like a Christmas or other type of party. Quite often those searching for a DJ and/ or KJ will mention that they are unsure how the process works. What does a DJ/ KJ actually do? Do they just show up, party and go home? I wish it were that easy but it is not. So, I have put the procedure into an easy 10 step progression of how the initial contact with your DJ /KJ right up to the loading out at the end of the night of your event moves along. Read on and I think you will find it interesting. As you probably know, initial contact often starts with and email or phone call to a music service that seems promising to a couple, individual or company looking for entertainment. I often suggest an email contact first as it allows you to be relatively anonymous. You can remain in control and an email also has the advantage of allowing you to put all the details in writing so the music service can have time to research and come up with details and a quote in writing. Sending out a concise and informative information package to each and every enquiry is step one. After sifting through and choosing a possible DJ /KJ, either a phone call or meeting is arranged with the possible client. At this stage, asking questions and going over a checklist of your event to put your vision of your function, is a great way to get a feel for the personality and organizational skills of the music service and for the DJ to get a sense of the possible client. A contract can be signed at this time or you may want to think about it. Whatever you do, always get a contract for the reasons I put forward in an earlier blog here. 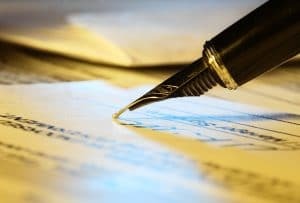 Vancouver DJ contracts and their importance. In any case the DJ and /or DJ should come prepared with a presentation that can answer all of your questions as well as contract. Ok, so now that you have hired your music service, you will want to start preparing your song list with the organizer check list that your DJ has provided. Your music services company normally has a very large variety of music collected over years of events and weddings and preparing for them as well as always acquiring new music. For any function though, organization is the key to having a smooth and trouble free event in terms of your music services provider. If your music and music instructions are written down, it puts everyone on the same page. You can also take a look at some of my other blogs on ideas for choosing your music. This is where your DJ puts your music and requirements together using a checklist that the DJ has prepared for your type of event. Now that much the organizational aspects of your event are out of the way, the big day arrives. Your Vancouver DJ and / or/ KJ should arrive early enough to load in and have everything set up and ready to go by the contract start time. Travelling to the venue does take time. The DJ service must allow for travel time. Also, important is a newer model and reliable vehicle to get themselves and their equipment to where they need to be. Sometimes people are looking for the best deal in a DJ. I always remind them that it is no deal for you if the DJ does not arrive because they run their business so near, or below, the line of profitability that they can’t afford a reliable car and it broke down on the way to your function. There are things that can hold up getting into the venue up, that is why I am so big on organization. I always check ahead to see if there will be any special instructions that may delay a vendor form getting into the venue. For some venues you actually have to load up on a dock, call someone to come get you , pull everything up to the room then come back down and find parking. 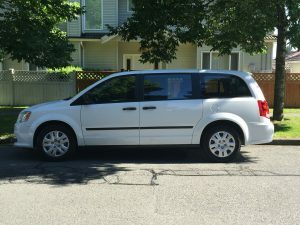 It can take up to 40 minutes to get into some places. 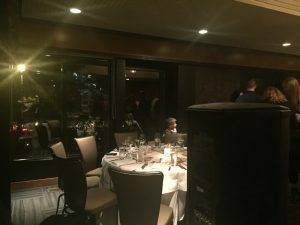 This DJ in Vancouver actually has a data base of venues and with the all the details needed for a timely load in and set up. I It is important for the DJ to meet the manager of the venue or captain of the room and get acquainted with them. Things go smoother and much more pleasantly when starting off on the right foot. It can set the mood for the whole evening right from there. I also sometimes find staff are not sure where to have the DJ set up so it is always good to be clear with instructions to your venue as well so that set up goes quickly and smoothly. Moving a setup to another spot often entails at least a partial tearing down and then setup again. This definitely can delay the music service starting on time so best to get it right the first time. The DJ striking up a positive rapport with staff always helps with solving challenges. After setting up the DJ and or KJ should often have a quick chat with the MC to be sure they both know what is going to happen and remind the MC to give the DJ heads up as to when the entrance, cake cutting, first dance are about to happen so that the DJ can cue up the music. Springing it on the DJ at the last moment is not recommended. Doing the event is of course where the action happens. This can look so easy to guests and even clients when the DJ hits their cues and has the dance floor hopping, but it is the preparation that gets the DJ to this point. Managing guest’s request as well as those of the client is a big part of this portion of the evening as well. A pleasant, approachable DJ / KJ is going to be a lot more fun than one who has their nose in the DJ equipment all evening. 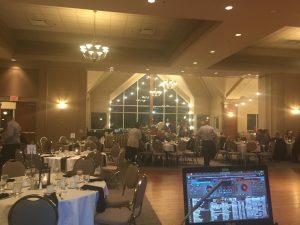 At the end of a successful evening, the break down and load out can actually be the most exhausting part of the evening for your DJ. Keep in mind that the DJ has arrived an hour to two hours before your event. So including that plus the set up, take down, load out and drive back to their home location, your DJ has actually worked an additional 3 hours, at the very least, on the day of your event. If you have a 7 hour event, your music service has probably worked at least 10 hours on it…not including music preparation time. As you can see, there is a lot that goes into the preparation and the activities of the DJ working your event. I hope this simplified ten step process give you an idea of what goes on in the music services world to create a successful event and or wedding. 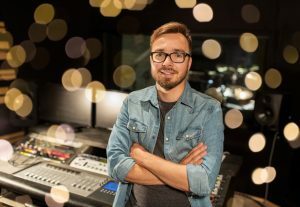 Although it is indeed a lot of work, this Vancouver DJ wants you to know that he enjoys every part of it. The Quality Inn Abbotsford as about an hour and a half drive from downtown Vancouver, and about an hour from New West or Burnaby. It is a full fledged hotel and what this Vancouver DJ likes about it, is that there is a separate are form the hotel where events are held. This avoids the noise conflict that can occur in hotels hosting events. 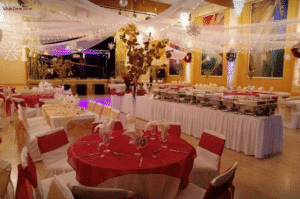 There are a number of rooms for events with the Grand Ballroom being the largest. It holds roughly around 200 guests. It also has a nice sized dance floor. A stage can be added for karaoke or performers. As a DJ in Vancouver, I experience many venues only allow a smaller space than what was allowed here. This venue gave the DJ/Karaoke set up two tables adjacent to the stage. This allowed the DJ to be in close proximity to the karaoke slips as well as the dance music request sheet. The DJ could answer questions easily as the speakers were away from the DJ station and there was lots of room for guests to come up and write requests. 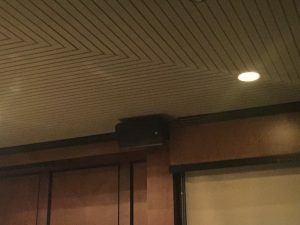 I did not notice a projection screen or in ceiling projector for any video or slide shows you might want to show. They do have a microphone and podium for your speeches…although it is not a wireless microphone. They still might have a wireless microphone and projector and screen available…I just never saw them. The buffet meal is set up in the hallway close to the bar. There seemed to be quite a bit of room and you can even put your photo booth out there as they did here. I found the bathrooms to be a bit far away from the main ballroom. They were clearly marked but it was a bit of a walk to reach them. As well, the coat rack was down at this end. If I had an expensive coat, I probably would have not wanted it to be down here far away from the room I was in. It is portable though so I am sure you could request to have it moved closer. The staff were very help full and friendly. They placed a table on stage when requested and brought the vendors cutlery and refreshments without even being asked. Most staff are good with guests but when they treat the vendors well, it shows and extra level of care and is a reflection of good management. 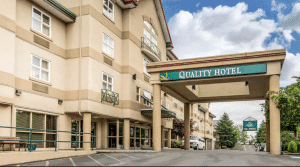 The Quality Inn Abbotsford is a comfortable venue to hold any event. The staff make you feel welcome and the fact that the event rooms are situated apart from the hotel rooms is a great plus if you want to party later and not worry about the music level. 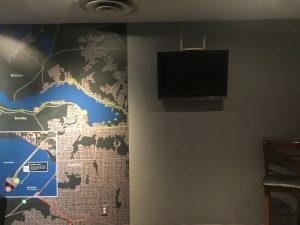 It is a bit of a drive from Vancouver so unless you have family from the Fraser valley or a reason that you might want hold an event there, a group from Vancouver might want to choose a closer venue. Check out the venue reviews on my website to see some options and a run down on them. However, If you are in the Abbotsford area, it is a good venue to consider. I give the Quality Inn Abbotsford a 4 out of 5 stars. The Arbutus Cub has a long history and one of the premier Private Clubs in Vancouver. It has a number of facilities including pool, tennis courts, gym, exercise facilities as well as many other services including the ability to host many different types of events. The parking lot at the Arbutus club is large. However, the club is very busy and it is usually quite full. They do have guest parking underground. This is also quite large and there is usually room for everyone. At the entrance to the underground parking lot you can enter a corridor to take you to the lobby of the club. This is great on rainy days. Parking is free as well…always a plus. Dropping off your guests may not be necessary with the corridor from the underground parking lot to the lobby, but if you want to do that, there is a flat sidewalk are next to the stairs where any mobility challenged guests can have easy access. For your vendors, they do need to load into the lobby from the front entrance and this makes it easy for them. The whole venue is wheelchair friendly. Vendors and guests must sign in at the front lobby and register their license plate number. They are then buzzed into the club. Elevators are straight ahead and the 2nd floor is where the event rooms are located. The elevator is a normal size so most vendors with equipment or wheelchairs will fit in easily. There are a number of event rooms of varying sizes. The Quilchena Terrace room is where I do most of the events for the club. It is a rectangular shaped room that could probably hold 80 guests but with the terrace, which is covered in winter, that could probably be doubled. The dance floor is small and the DJ is normally setup by the bar so it is tight quarters. I find a smaller DJ setup is about all that can be fit into the space that they give for the DJ. 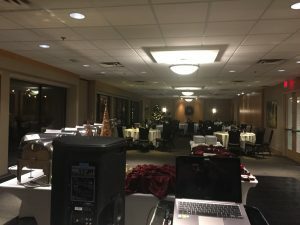 There are not that many outlets so at Christmas time when all the trees and decorations are plugged in, it can be a challenging time for your Vancouver DJ to find power. It is normally a buffet style setting for dinner and it is set up on the dance floor. This also takes up room and limits the size of your DJ setup if the music setup is in the regular spot…which right at the edge of the dance floor. One thing I like is that they have a hallway closet outside of the room to hang guest’s coats. This keeps the room looking very clean and neat. It also gives to room a little more space. Guests do not have to worry about draping their coats over the back of their chairs as well. The terrace of to the side of the room is an extra space that can be utilized for larger parties. In the summer, it is a nice are for the guests to lounge and enjoy the sunshine. In the winter, it covered by a tent structure. Unless it is being used it is unheated and if the terrace doors are left open , as guests often do, it can make the Quilchena room cold. The staff is friendly and if your vendor is friendly, they will try to help them out. 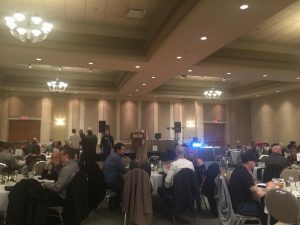 This venue seems to have set way of doing things so if you want your DJ in Vancouver to set up in a different location, then it would be wise to be very clear when booking the room so that staff are aware of any changes to the normal routine. Your vendors should be aware that the front lobby closes at 11 pm and the front doors to the club are locked. 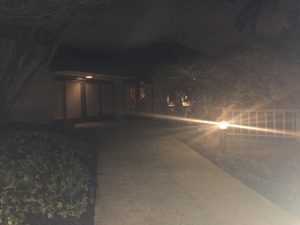 If your event is going past 11 pm, your vendor will need to make sure the night manager is around so that the vendor does not get locked out while packing up equipment, going to get their vehicle from the underground parking, and trying to get back into the club to load the equipment from the upper room to downstairs and into their van. 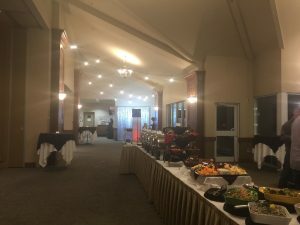 The Arbutus Club is a conveniently located venue that is able to cater from small to mid sized events. Even though it has a bit of a community center type feels at the entrance, once in the event rooms, that disappears. With the free parking and neatness of the facility, I give the club a 4 out of 5 stars. 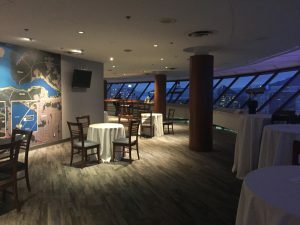 The Vancouver Lookout not only has a unique shape that adds a different ambiance to your event but it also has an awesome view for your guests to enjoy. A 360 degree view of the city is one of the best ways to get an overall appreciation of the scope of what Vancouver is about. 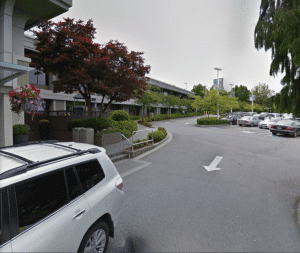 Starting at the parking for the venue, it is a bit easy to miss as it is right at the corner of Seymour and Cordova at the 500 Harbor Center underground parking. 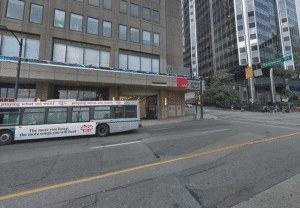 There is a bus stop right at the entrance so when a bus is there, it can make it even more challenging to find. Turn right off of Cordova into the underground parking and keep going straight. Don’t turn left into the loading dock. Getting from the parking lot to the lobby is quite easy and there is access for your mobility challenged guests. The lookout deck also has ramps all the way around so all guests can enjoy the view. The lookout venue is quite spacious and could accommodate a large group of guests. The thing to note about the venue being round is that your music would not carry all the way around the venue. You would either have to find a way to plug into the house system, which would be ok for background music but not dance music, or have your Vancouver DJ set up extra speakers around the venue. This last option could get expensive. I would also be clear on just where you want your music provider to set up before they arrive for your occasion. The staff was not aware of where the client wanted the DJ setup when I arrived. Once setup is done and lighting, cables and tables are set, it can be difficult to move equipment without taking some of it down and setting up again. This can cause your music to start late. There seems to be quite a few wall outlets so you can plug in extra items. Be sure to leave an outlet free close to your DJ setup so that your entertainment can plug in as well. 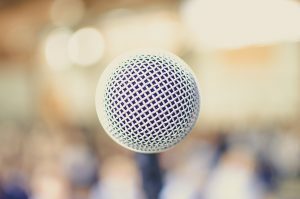 The venue does not have a microphone for speeches or a projector and screen for your video or slide show presentations. I did notice a few TVs around the venue so you might be able to plug into those. Otherwise, you might need to bring your own projector and screen or have your DJ in Vancouver provide those items. Load in for your vendors is a bit cumbersome. They must load in from the loading dock, call up and have one of the staff come down and let them in, bring the equipment up to the lookout area and go back down to park their vehicle. All this could take quite a bit of time so make sure your vendors plan ahead and arrive early enough to allow time for this. It took this DJ about 30 minutes to get in and I did not have to come back down to park my van. A plus is that they do give vendors their own pass key so that if they do have to come back down to the loading dock, they can get in and out on their own. However, the vendor can’t get back into the loading dock area after 6 PM if they drive out for any reason. The staff is helpful and friendly but may be a little short staffed. When I was ready to setup 45 minutes prior to the event, the DJ tables were not ready and guest tables still being setup and dressed. They did manage to have things ready on time and once the event got going everything ran smoothly. 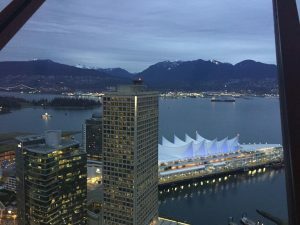 The Vancouver lookout has got some nice perks for the location of your next event. Beautiful views, a downtown location close to Gastown and the skytrain hub are a few of them. The round shape of the the venue makes it hard to get music all through the venue and the time it takes to get your vendors in concern me enough t o give the Vancouver Look out a 4 out of 5 stars. Seasons in The Park has a number of rooms available for your wedding or events. Each room has its’ own character and accommodation size in order to cater to your requirements. The Heritage room is probably the smallest room at Seasons. 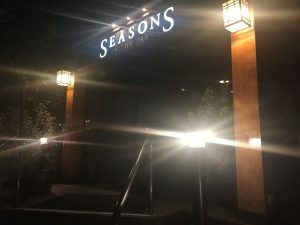 At Seasons, parking can get crowded close to the venue if there are a number of events taking place at the same time. You may have to park in some of the parking areas that are further away so remember to bring an umbrella on rainy days. Fortunately, there is valet parking available for around $11 for the evening. There is a roundabout just beyond the valet parking where you can temporarily park and let your mobility challenged guests out. It is not covered though so here again, bring an umbrella in case of rain. A flat sidewalk does run form that area to the main entrance for Seasons and for the adjacent entry into the Heritage room. The Heritage room would be hard pressed to fit more than 45 guests and still have room to move around plus room for your Vancouver DJ. There is no dedicated dance floor and the room is carpeted, making a it a little difficult to dance on for some. They do have a wireless microphone for your speeches. 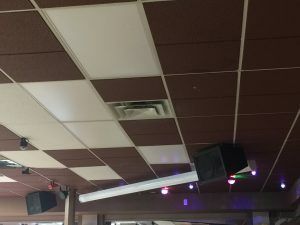 The ceiling speakers would not be adequate to play dance music but would work fine for dinner background music. The venue is a bit drab in the décor department. It is done in brown wood paneling giving it a dated and dark ambiance…especially at night. 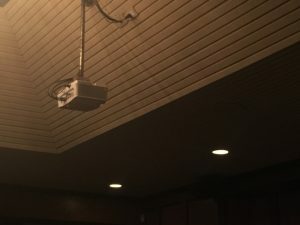 The room does have an in ceiling projector and retractable screen for playing your video and slide show presentations. One thing to note is that there are not many wall outlets. An extension cord and power bar may be a necessity if you want to plug anything in. Keep in mind your DJ in Vancouver will need an outlet as well. The Heritage room faces a row of high trees so I am afraid there is no view out of the large windows. Some of the other rooms at Seasons do have nice views overlooking the city. In the summer, the view would at least be green until the sun went down. A nice feature of the venue area is that there is a very nice park for your guests to wander in if, for example, you have a wedding ceremony in the park and your guests need something to do before the reception starts. There are some nice areas in the park for picture opportunities and for strolling. The Bloedel Conservatory is also located in the park. It is another great way for your guests to enjoy their time. Staff are friendly and quite helpful. The food for all the event rooms is prepared to the standards of the Seasons in the Park restaurant. In the Heritage room, it is a sit down served service. The Heritage room at Seasons In The Park is a modest venue to hold a small wedding or event. Although it does not have some of the perks of the other rooms, it is perfectly adequate and in some cases, due to the location, quite a pleasant experience. I give the Heritage room 3.5 out of 5 stars.